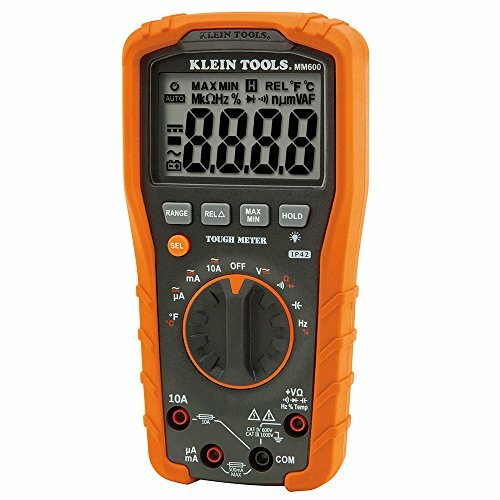 This automatically ranging digital multimeter that measures AC/DC voltage, AC/DC current, and resistance. It can also measure temperature, capacitance, frequency, duty-cycle, test diodes and continuity. Exclusively designed from the ground up by electricians for electricians. Years of field research, combined with extensive input from electricians across America, inspired the development of metersloaded with innovative, time-saving features. Measures up to 1000V AC/DC voltage, 10A AC/DC current and 40M resistance plus temperature, capacitance, frequency, duty-cycle, test diodes and continuity. CAT IV 600V / CAT III 1000V safety rating. Built to endure a 6.6-foot (2 m) drop and withstand daily wear and tear on the job site. Low battery indicator and easily accessible battery and fuse replacement compartment. For use in basic and controlled electromagnetic environments such as residential, business and light-industrial locations. Includes carrying pouch, test leads, alligator clips, thermocouple with adapter and batteries. For more than 160 years, Klein Tools has manufactured premium-quality, professional-grade hand tools that deliver the performance, durability and precision needed to get the job done right. Our family of engineers, workers and craftsman continue to put six generations of expertise into every tool we create by using only the highest quality materials, superior workmanship, and keeping manufacturing as close to home as we can. Klein isn't just the name of our company, it's also our family name. And since we're an American company that's family-owned and family-run, you know you can count on us to be here tomorrow. Klein Tools doesn't just make great products, we make great products that stand up to the demands of the professionals who use them every day ... Since 1857.